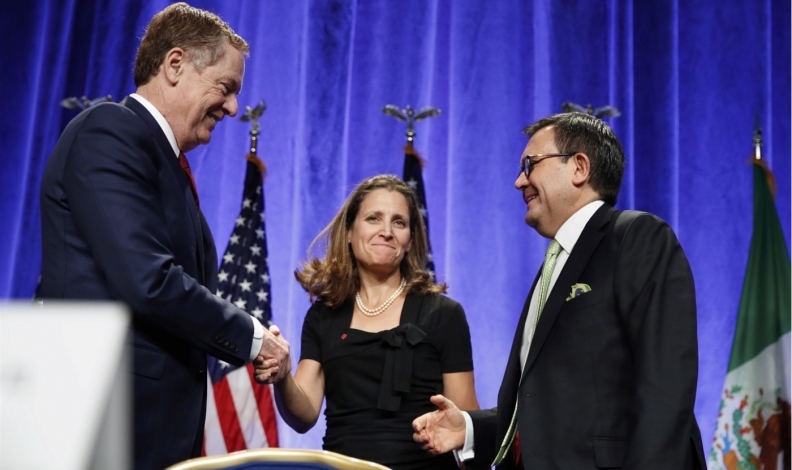 Canadian Foreign Minister Chrystia Freeland criticized a one-sided strategy in NAFTA negotiations after U.S. Commerce Secretary Wilbur Ross said he wasn’t prepared to make concessions to reach a deal. “A negotiation where a one party takes a winner-takes-all approach is a negotiation that may find some difficulties in reaching a conclusion,” Freeland said Thursday during a press conference in Toronto, without specifying which party she was referring to. She later added Canada understands the value of opening new export markets in China and elsewhere. “Perhaps now we understand it more urgently than ever,” she said. Ross, speaking Wednesday to CNBC, said no one should prejudge talks and that he expects there will be a NAFTA “proposal” he can eventually take to U.S. President Donald Trump. Whether Trump accepts it is another matter, Ross said. The previous round wrapped up this month with ministers trading barbs amid five key impasses on automotive content, dairy, dispute panels, government procurement and a sunset clause proposed by the United States. Mexico and Canada are effectively dismissing U.S. proposals on all five.